A reader sent me this picture of an upcoming toy car. And it looks a lot like the next Honda Accord. At least it could be. 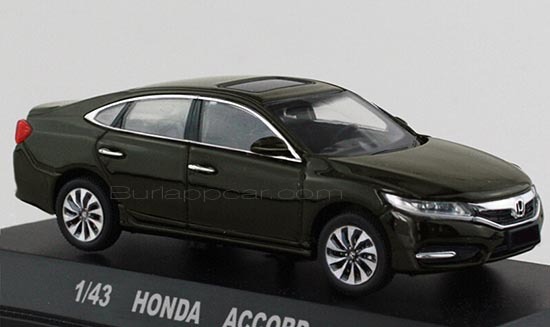 An all new Accord is due out next year. A big year for mid sized sedans since an all new Toyota Camry will join the party at around the same time. The new Accord is based on a longer version of the current Civic. So it will actually be a bit shorter than the current model. Also expect a 2.0 Liter turbo to replace the V6. Not sure if the base engine will still be the 2.4 Liter or the newer 1.5 Liter Turbo. I just don't get these 3rd world looking designs coming from Honda. An ugly photoshop of an amateur. It is unfortunate that they made it look like the cheaper Civic. The current model was probably the best looking Accord to date until they ruined it with the heavy chrome grille. It looks like they want to appeal to the Chinese market. This is better than the crap "sent by a reader." It might be "better". But that is NOT the next Accord. It is the concept C from 2012. A 4 year old concept for the Chinese market that has nothing to do with the next Accord for the US. Honda and Toyota are no longer the leaders. The next Camry and Accord are going to look a lot like the 6-window fastback design already sitting on Ford (Fusion), Chrysler(200) , Hyundai(Sonata) and Chevy (Malibu & Impala) lots. The Accord Sport is one of the best looking mass production sedans on the road today. Honda will improve on the current one. I am not sure why Vince posted this POS. It looks like someone slapped one of the Honda grilles on some 20 years old Chevy. It could just be an upcoming Civic toy, or a photoshop of the toy above with Civic-like looks. But it's also based on a toy that came out last year. Maybe it still predicts the 2017 car, who knows, but I think our Accord will look a little more refined then this, even if it is simply a larger version of the civic. Wow, Honda makes the Toyota Camry.....Crappy. Looks like a Chevy Impala that rear-ended a Honda. If it's just an overgrown Civic, then I truly hope they keep the size of the current Accord, and the reason I say this is because I really like the design of the new Civic, but if they were to stretch that design out on a much larger car, it would really give the design some room to breath, and essentially, it'll be an Acura poor man's version of the Porsche Panamera or Audi A7, a true 4dr coupe of that variety, rather than giving a sedan coupe-like styling as you with everyone from Hyundai to Ford/Lincoln, etc. With aerodynamics being a major factor in increasing the mpg ratings, all sedans end up getting a fastback roofline. The challenge is to maintain rear seat ease-of-entry and headroom. The Sonata does it best and the Chrysler 200 is the worst...which is one reason it's done. I think a very good idea of the Honda factory in the United States for its part I really like its design of this car and how many to the engine of 4CIL turbo mounted on the new Honda Civic is very impressive to replace the V6 but there if I disagree because the average size sedans in their most have their V6 engines between the Toyota , Nissan, and Kia. One bad idea; The Nissan Murano Hybrid.